Why Buy from Riley Ford? Structure My Deal tools are complete — you're ready to visit Riley Ford Inc! How Can You Save Money with Tire Rotation? Tire rotation is essential for the extended life of your vehicle's tires. By scheduling tire rotation at regular intervals offer car owners a number of benefits that many fail to consider. One of the biggest benefits to car owners is that it helps in saving money. A lot of people have car batteries because they own a vehicle. Managing their replacement is something that savvy car owners do regularly. It is good to work on checking your car battery's condition after it reaches the 3-year mark. An annual inspection can prevent a painful correction during a trip. Car batteries often are loaded down with toxic chemicals, so do not try to fix the battery yourself if you have little experience. What do we here at Riley Ford Inc appreciate the 2017 Explorer, our esteemed American automaker's full-size SUV? Admittedly ... everything. It's quite clear that Ford served up a stunner with this one. There is absolutely no denying the Explorer's entry-level drivetrain, a 3.5-liter V6. Do you have a family you need to take to numerous weekly activities? What about a long commute you are looking to save gas on? Do you enjoy weekend getaways? Then you should consider the new 2017 Ford C-MAX! This low priced car has seating for five and gets an average of 42 miles per gallon in the city and 38 on the highway! You won't have to worry about wasting gas on your commute or on your road trips anymore! A number of factors come under consideration when it's time to look into a new SUV. Safety and convenience features play a major role if you're always on the go, as does reliable under-hood power. Likewise, cargo space. The 2017 Ford Edge has you covered on all counts. Starting the new year by stating the obvious, Cars.com named the Ford F-150 Raptor the 2017 Pickup Truck of the Year. 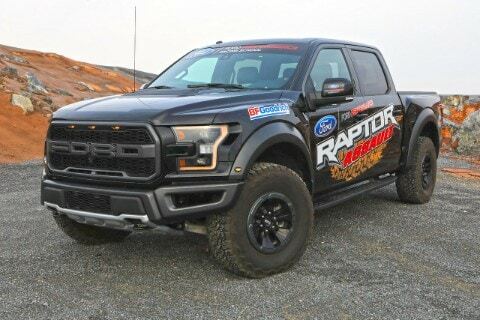 According to media.ford.com, the Raptor was nominated along with the totally redesigned and reengineered 2017 SuperDuty.